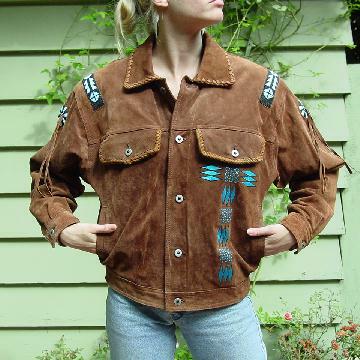 This Southwestern style jacket is in medium brown suede. 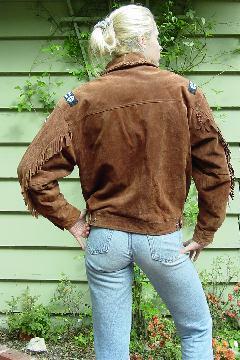 It has a braided leather trim around the shirt collar and the 2 flaps on the deep breast pockets. There are 5 buttons down the front, one on each flap and band cuff, and 2 on each side at the back waistband. An extra button is included. There are 2 side slit pockets. There is a 2 1/4" fringe on the sleeves' center back seams extending 14 1/4" from the shoulder. There is bead work on each shoulder front to back (8" by 1 3/16") consisting of a background of black beads with white and powder blue in an Indian design. On the top of each sleeve is a circular bead design in black, white, and powder blue with 3 long fringes extending 10 1/2" outward. Under the left breast pocket extending toward the bottom is a turquoise thread Indian pattern design. 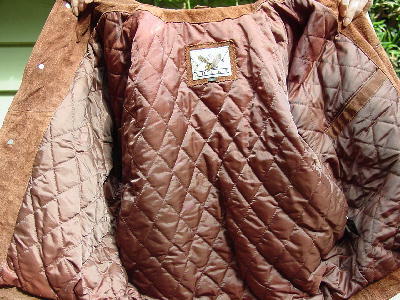 It has shoulder pads and a brown quilted lining. A model bought it for $350 and wore it to the Sundance Film Festival, where she got lots of compliments about it. She moved to Miami full time, and no longer needed a suede jacket. shoulder to shoulder 21 1/2"
shoulder to end of sleeve 22 1/4"
shoulder to hem 23 1/2"
armpit to armpit 22 1/4"